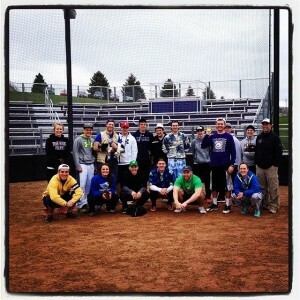 Warhawk Fitness and Aquatics Family! Coming to college was one of the biggest steps of my life. Moving 2+ hours south from home, not knowing a single person, and then try to find new friends; there is nothing scarier. So what did I do? I attended events, went to class, and even forced myself to talk to the kids on my floor. Nothing really worked; we didn’t really connect. I didn’t really feel like UW-Whitewater was where I fit best, until I was hired as a Fitness Supervisor for Warhawk Fitness & Aquatics. Not only is it a great job but it also allows me to meet so many new friends, two of them being my best friends still to this day. Becoming a Fitness Supervisor was where I started, but I didn’t stop there. Being a Fitness Supervisor is a very exciting and rewarding position. The shifts are small enough that they work around your academic schedule and the daily cleaning duties are simple enough that you can still enjoy time meeting and greeting the patrons that come into the facilities. One of my favorite parts about being a Fitness Supervisor is that I am able to see other individuals take their health into their own hands. After a semester of being a Fitness Supervisor, I got hired to be a part of the Public Relations team. We write blogs such as this, that allow each of our members to show their interests and passions by writing about different health or wellness related topics. We also tweet/post/pin to our Twitter, Facebook, Pinterest, and Instagram accounts with different ways to stay healthy on campus, recipes, inspirational quotes, Warhawk Fitness & Aquatics updates, and other healthy campus events. Don’t follow us? START NOW! The next step in my journey is in the spring of 2014 I was hired as a Group Fitness Instructor. There is nothing more rewarding than being able to use your personal passion to help influence others. Another way that we help others is each month we have a “Pay-It-Forward” program where we donate certain items, cash contributions, or volunteer time to an organization that we choose needs assistance the most. There is nothing more rewarding than helping others, which is one of the top priorities for the Warhawk Fitness & Aquatics family! If this doesn’t prove why you should apply to work for Warhawk Fitness & Aquatics, I don’t know what will! Are you hard working, dedicated, reliable, energetic, and fun to be around? THEN APPLY NOW! This past summer I was given the opportunity of a lifetime when I was able to travel to West Africa for two weeks. I traveled the country of Burkina Faso meeting people, helping people, visiting orphanages, and making memories. Through those events, Africa became one of the most impactful trips of my life. In Burkina Faso, they like to take life slow. Sending a single email can take up to six hours. Being an American, I wasn’t used to this style of life and constantly found myself tapping my foot and checking my phone impatiently…but after a few days, I finally started to open my mind and realized they may be onto something. Life isn’t supposed to be rushed. Over in Africa they aren’t worried about sending 50 emails, or checking their phone every minute, or hurrying through the workday. The people of Burkina take their day as it comes along. If something doesn’t work out, they go with the flow and accept it instead of letting it ruin their whole day. I learned to truly admire this way of life. When I think of the term “wellness” I think of living a low stress life. I personally can’t think of a better lifestyle to lead to your personal wellness than the lifestyle in Burkina Faso. Take life slow, live stress free, and be happy because the sun is shinning. Although those goals are not always easy, anytime I become overwhelmed I think back to Burkina. Fitness is something else that has a different definition in Burkina. The people don’t obsess about going to the gym or lifting weights like we often do hear in the states. As a matter of fact, the whole time I was there I never saw a single gym. They get their exercise from carrying goods on their heads all day, or walking the streets selling fabrics. I would see women walk up and downs streets all day carrying bananas on their heads and babies on their backs. Without even intentionally realizing it, these women “workout” more in one day than a lot of Americans do in one week! Overall, the people that I met abroad were very hardworking. Sometimes it’s easy to get lazy living in the states. Everything is pre-made and ready to go for you, but over in Africa they make everything from scratch. 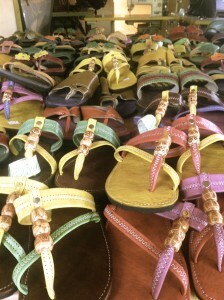 I bought a pair of shoes from a man after I watched him cut the leather, sew the leather to the sole, and fabricate the whole shoe. Same goes for the hand carven drum I purchased; wood was craved, hide was stretched, robes were tided together. It truly is amazing to see a scarf being made string by string. The point is, the people taught me to not be lazy. Do not live an easy pre-made way of life, but strive for high quality. High quality fitness, high quality wellness, and overall a high quality life. Don’t Regret What You Ate, Tailgate! It’s that time of year that a lot of us college students look forward to, homecoming! From all of the activities during homecoming week, to actual game day this is a time where college students get to celebrate their school pride, hang out with friends, and of course cheer on the home team! It’s overall a day of fun, and what kicks off a homecoming game better than a good tailgate party? Since it is a day of festivities and fun, you may want to put aside a healthy conscious for the sake of occasion. Save that mind set for the holidays and make this day a tasty but healthy one! I know what you’re thinking, you’re not about to show up to a tailgate party with a zip lock bag of baby carrots and apple slices. But fear not! 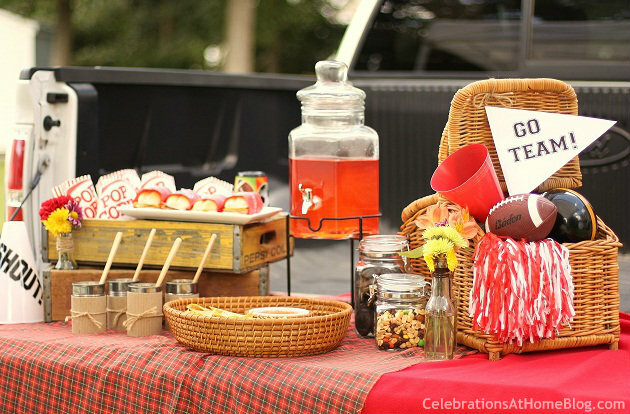 These fun and festive tailgate foods will make you wonder why you ever stuck to the generic and boring hot dog. If you’re grilling out: Then you have a variety of options! Kebabs, burgers, or even marinated veggies on the grill. Kebabs: All you really need are skewer sticks, and a combination of your favorite veggies and you can add a lean protein like chicken or shrimp or you can even make a fruit one! Kebabs are an easy thing to eat when you’re at a tailgate because no fork or plate is needed! Burgers: If you’re hesitant to stray away from your beloved hamburger, consider these healthier alternatives when grilling out. Being a vegetarian I always love having creative, healthy, and unique alternatives to meat. At family picnics I’m the one usually eating either portabella mushroom burgers, a black bean veggie burger, or an eggplant burger! Check out different veggie burger recipes here! As for you meat eaters, grilled chicken, a salmon patty, or turkey burger are also leaner alternatives! Grilled veggies: If I haven’t already made it clear grilled veggies are one of my favorite things to eat on the grill. Some people might think that it is boring, when in fact there is so much you can make. Such as a grilled blooming onion, marinated eggplant , stuffed grilled artichokes, sweet potato fries! Just be careful of what oils and sauces you add and limit any cheese added! Chip dip: Stray away from dips that are cheese or cream based because it’s easy to get carried away and eat too much of what is a very dense, and fattening dip. So instead of taco dip that you can get at the store, try a black bean dip! Also, what I personally feel is the solution to everything, you can have hummus! There tons and tons of homemade hummus recipes with different types of ingredients that you can add. The great thing about both of these chip dips is that they are made of beans so they will have more protein and nutritional content then any cheese dip or taco dip would! Finger food: A few bite sized choices for a healthy appetizer are guacamole deviled eggs, and zucchini pizza bites! Both are a fun and nutritious twist on appetizers we’ve had before like deviled eggs and pizza bites. Pre-make these before you head on over to the tailgate and wow everyone with your unique snack creation. An appetizer for events like a football game tend to be fried, or full of cheese, which is the worst thing you can do when you haven’t eaten anything yet! So start off your meal with real food, and you’ll be full and satisfied by the end of your meal instead of craving more! Tailgating is one of the best parts about going to a football game! So don’t ruin the experience for yourself by indulging in high fat food. You can’t cheer on your team when you’re bloated and in a food coma so eat clean, but never boring! These ideas and recipes are in my opinion exciting and different than most tailgate foods so have fun with it! Go team! What are you Really Dipping in to? We all know that French fries, pretzels, carrots, sandwiches, etc. all taste better dipped and lathered in your favorite sauce. Ketchup, mayo, honey mustard, ranch: they all are so delicious but have you ever thought that maybe those small additions to your meals are causing a set-back? 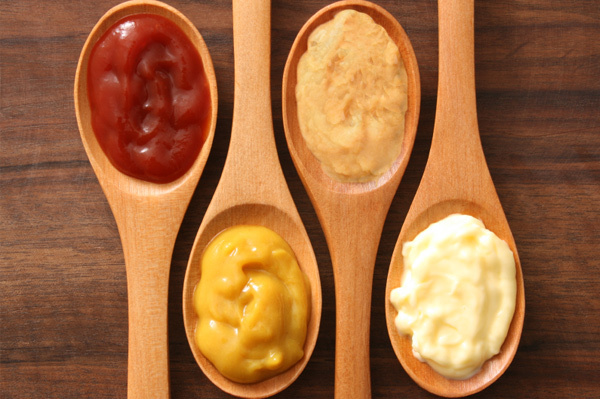 Condiments are packed with lots of fat, sugar, and calories. It’s time to swap the bad and find new ways to still enjoy your favorite foods! I am not encouraging you to cut out condiments all together! Just try to think a little more about what else ketchup, mayo, ranch, barbecue, etc. adds to your favorite foods other than just flavor!